The TwinCAT PLC is programmed in accordance with IEC 61131-3 independently of the manufacturer. Online connections with PLC runtime systems around the world can be implemented with TCP/IP or via fieldbuses on the IPC. TwinCAT PLC offers all the languages in the IEC 61131-3 standard and has a powerful development environment for programs whose code size and data regions far exceed the capacities of conventional PLC systems. Changes to programs or data are supported by a very powerful link to the runtime systems, which can also operate over a network. All the usual facilities of a PLC are available. Any Windows programs, for instance visualisation programs or Office programs, can access TwinCAT data via Microsoft interfaces or control the PLC. Changes of any size to program and data can be carried out “online”. Error location and correction (debugging) is supported by aid of a very powerful link to the runtime system. This can also be used over a network. 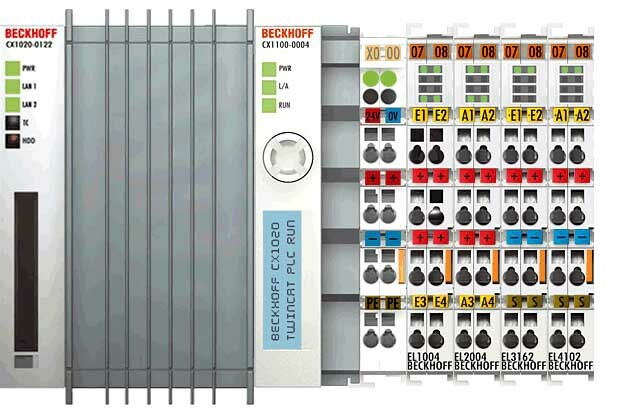 All the usual features of a PLC are available. Online connections with PLC runtime systems around the world can be implemented with TCP/IP or via fieldbuses. Watch list shows a selection of variables. Trace function records variable values for every cycle. TS4100 The TwinCAT Controller Toolbox library contains blocks for basic controllers (P, I, D), complex controllers (PI, PID), pulse width modulation, ramps, signal generators, filters. TS1600 The TwinCAT Engineering Interface Server integrates drivers for interfacing with Microsoft Visual Source Safe or Subversion.